You are here: Home » MEDIA » Books » H.G. Wells: The Collection by H.G. Wells (book review). H.G. 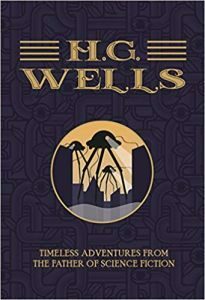 Wells is perhaps the classic late Victorian Science Fiction writer. But while some of his novels remain quite familiar, his shorter stories have unfortunately been overlooked. It is therefore very pleasing to find that this anthology not only includes his four most famous novels and novellas, but several of the more highly regarded short stories as well. Given the low cover price, that should make this book an excellent addition to the bookshelf of pretty much anyone interested in Science Fiction writing. The collection kicks off with ‘The Time Machine’, one of Wells’ best known stories. One reason for that is its brisk pace and unfussy writing style. Even by modern standards, it’s a quick read with many memorable scenes and situations. It probably goes without saying that ‘The Time Machine’ is a hugely influential work, in many ways laying down the ground rules for time travel stories such as ‘Doctor Who’. Adapted directly into films and comics, it’s also inspired a number of derivative works, including a well-loved romantic thriller, ‘Time After Time’, that itself spawned a recent TV series. Like most of Wells’ output, there’s more to ‘The Time Machine’ than simply hopping through various highlights of human history. The key thing is that Wells is warning us of one possible future, one where humans diverge into two different species. The beautiful but child-like Eloi are the descendants of the rich, privileged classes, whereas the ugly but industrious Morlocks that actually keep the world running came from the working classes. Given the nature of the relationship between the Morlocks and Eloi, his social critique remains as compelling today as it did when it was originally written. But one of this reviewer’s personal favourites is ‘The Island Of Dr. Moreau’, a cautionary tale about what happens when scientific freedom is placed before medical ethics. In this case, the brilliant Dr. Moreau has been using vivisection techniques to advance various animals into more human creatures able to think rationally, talk and even walk upright on two legs. The cruelty of the piece comes from the temporary nature of these advances: without regular and evidently painful procedures, the animals will eventually regress into their savage state. Wells’ central theme here is that while Moreau is clearly a genius, able to create what are effectively new forms of life, he isn’t a benevolent god and, while the tropical island might seem to be a second Garden of Eden at first glance, it’s really much more of a Hell for those poor animals trapped within it. While ‘The Island Of Dr Moreau’ is perhaps a little less familiar to modern readers than ‘The Time Machine’, the third story in this collection, ‘The War Of The Worlds’, is surely one of Wells’ best known. The basic story needs no introduction and its reportage-style prose remains a landmark in the development of modern Science Fiction. At a time when the British Empire was at the very height of its power, the invasion and apparent conquest of humanity by the Martians is easily read as an exercise in hubris. So when the Martians are finally defeated, the fact the agents of this victory are germs and not people savagely highlights the precarious assumptions that lie beneath our perceived superiority over other forms of life. The last of the longer stories in the book is ‘The Invisible Man’, a novel that is not widely read today but with a central character who remains as obviously influential as he is difficult to see. In some ways it is indeed a character study rather than a piece of Science Fiction, though the concepts behind the story certainly involve the sciences, in particular, optics and the theory of light. Parallels can be drawn with the myth of the Ring of Gyges, in other words, the idea that people behave morally only when people can see them. Remove that restriction and even the most moral people quickly turn into self-serving hedonists, perhaps even dangerous villains. The remaining ten stories in the book are all shorter works. ‘The Sea Raiders’ is a straightforward monster story, suggesting that the giant squids being described at the time were but indicators of much larger and more dangerous cephalopods lurking in the deep sea. It might not take much, a mere change in water currents perhaps, to bring them closer to the shore, where they might pose a threat to sailors and beachcombers. While obviously drawing its inspiration from the sorts of things published by the Professor Challenger deep sea survey, the unexpected threat, followed by the ambiguous resolution, has something of the cosmic horror theme later explored by the likes of H.P. Lovecraft. Similarly, ‘The Star’ uses recent advances in astronomy and mathematics to create another existential threat to humanity. While this story isn’t particularly well-known today, it’s very much a precursor of the sort of thing John Wyndham and others would write. The appearance of a new star in the Earth’s Solar System is slowly revealed to be an apocalyptic event, with the focus not simply on the ensuring havoc, but on the science involved and ultimately how mankind just about manages to survive. There’s a neat twist at the end that ties things up nicely with the existence of Martians, something that Wells’ contemporaries often took for granted. Others are cautionary tales of the sort Wells wrote so well. ‘The Diamond Maker’ and ‘The Country Of The Blind’ are examples. As the title suggest, ‘The Diamond Maker’ is about a man who invents a method of creating artificial diamonds but, in doing so, finds himself unable to actually sell the diamonds he makes. The twist is, of course, that in trying to find a shortcut to fabulous wealth he ends up falling into poverty. ‘The Country Of The Blind’ is also about a man who wants to improve his situation but, again, finds that this is sometimes harder than it might seem. When he encounters an isolated community of blind people in a remote part of South America, the protagonist gradually discovers that his supposed advantage is much less useful if those around him dismiss the very idea of sight as being a physical impossibility. In both these stories, the underlying principles are scientific in nature, the first concerning advances in chemistry, the second what was at the time becoming our modern understanding of disease. But as parables, they’re timeless and the brevity and easy writing style ensure they’re among the most entertaining of Wells’ stories. The other stories included in the book are ‘The Red Room’, ‘A Dream Of Armageddon’, ‘The Lord Of The Dynamos’, ‘The Cone’, ‘A Moonlight Fable’ (also known as ‘The Beautiful Suit’) and ‘The Door In The Wall’. Of these, ‘The Lord Of The Dynamos’ is often singled out by critics as showing the latent racism common in Victorian England. On the other hand, it’s also a story about the contrast between Victorian religious belief and their enthusiasm for the rapid progress promised by advances in science and technology. All in all, this is a fabulous collection of excellent short stories and absolutely seminal novels. At least some of these stories are must-haves for any fan of Science Fiction and, for those who haven’t had the chance to read them, this is a good value collection well worth its modest cover price. « Bonehill Road (2018) (a film review by Mark R. Leeper).